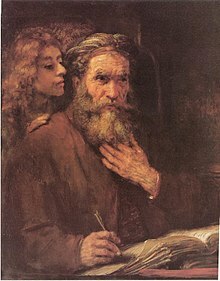 Saint Matthew is one of the twelve apostles of Jesus. Matthew wrote the Gospel of Matthew in the New Testament of the Christian Bible. Sometimes, he is called Levi. He was a tax collector before his decision to follow Christ. This page was last changed on 8 April 2019, at 02:39.